Today you want to work on achieving balance and symmetry in all areas of your life. The Temperance card refers to bringing the opposing facets of your personality (or your relationships, or your desires) into alignment by finding the perfect middle ground. It’s about peace and harmony, synthesis and equilibrium, moderation and restraint. The woman in this version of the card rests comfortably at the edge of body of water, patiently pouring water from one vessel into another. She has flowers in her hair and angel’s wings on her back. The Sun and Saturn sit high in the sky and a bright star shines on her from afar. Land, sky and sea creatures rally all around her. There are birds, reptiles, mammals, insects and fish, all in her immediate proximity. There’s a calm, tranquil energy expressed through the imagery in this card. It encourages us to stay centered and not tilt too much in one direction or the other. 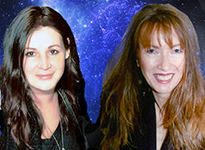 Although you may have to make a decision today — and although that decision may require you to give something up — focusing on compromise and cooperation will go a long ways toward mitigating dissension. Today’s Mercury / Jupiter sextile is a perfect transit for testing out this premise. It’s all about communicating effectively and resolving misunderstandings. This aspect is very like the Temperance card in that it promotes cooperation and harmony. You may feel compelled to reach out to someone and heal old wounds, or may take the first step toward establishing a new connection. Either way, remember the message behind the Temperance card: avoid excess, practice diplomacy, and offer reciprocity. 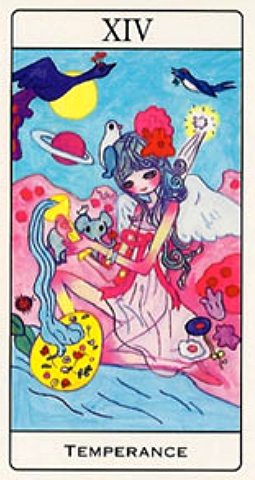 The card used for today’s tarotscope — Temperance — is from the Aya Takano Tarot, designed by Japanese artist Aya Takano. Here is her tumbler page. Her stunningly beautiful artwork is available for purchase.